Google has patented its home page, a digital rectangle famous for including almost nothing. On Tuesday, the US Patent and Trademark Office awarded Mountain View a patent for "the ornamental design for a graphical user interface for a display screen of a communications terminal." That graphical user interface is, yes, the Google home page. Or at least, the Google home page of 2004. Everything within the outside dotted line is patented - except the dotted Google logos. The logos are already trademarked. 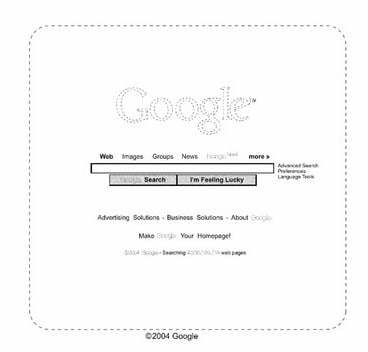 The image represents Google's home page in early 2004, when the company submitted a patent application for the design of both the home page and its search results page. The home page was spun off as a separate application in 2006, and yes, Google received a patent on its results page too. According to Doug Wolf, a patent lawyer with the Boston-based firm Wolf Greenfield, Google patent is highly unusual. But there is precedent. Famously, IBM owns design patents for various GUI icons. A design patent - as opposed to a utility patent - covers aesthetics. So, Google's patent is limited to the (few) words on the home page and how they're arranged. Considering that Google has rejiggered its home page over the last five and a half years - moving some links to the top of the page, for instance, while adding a "privacy" link under duress - it would seem that the company's legal protection is a bit out of date. "It's very hard to infringe a design patent. Someone almost has to copy it exactly, and their intent isn't really an issue," Wolf tells The Reg. Since Google has shifted several links since 2004, the patent may be useless against anyone who mimics the home page as it appears today. Google's five-and-a-half-year effort to patent a white rectangle looks an awful lot like a vanity exercise. It's no secret the company is pathologically enamored of the site's stark design. Google's current decree is that the page mustn't include more than 28 words. Last year, when countless public watchdogs barked for that privacy link, Google initially resisted, citing the sacred 28 word rule, and it only relented after finding a way to include the link without adding a 29th.